The Clarke County Historic Preservation Commission recognized its 2012 historic preservation award winners on Thursday. The Barns of Rose Hill, along with its visionary, Diana Kincannon, both received awards. Holy Cross Abbey and Dorian Sono Luminus recording studios of Boyce were also recognized. The ceremony also included Virginia House of Delegates member Randall Minchew who presented a formal resolution honoring the late David Boyce to Boyce’s family. More than thirty people met at Berryville’s historic Battletown Inn for the annual award ceremony honoring individuals and organizations that have made important contributions to preserving Clarke County’s historical character. Holy Cross Abbey and the Trappist community were recognized for their work in preserving the 18th century mansion and preserving the monastery’s historic 1200-acre surroundings. 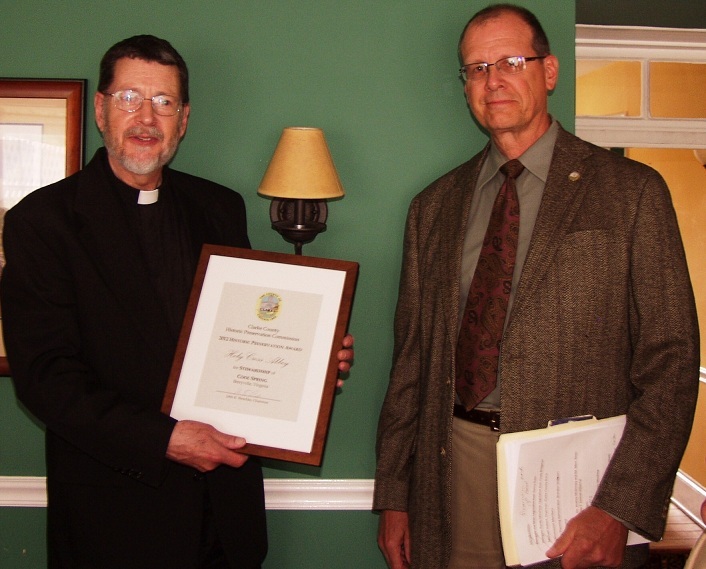 Historic Preservation Commission member Marty Hiatt presented Holy Cross Abbey’s Abbott Father Robert Barnes with the 2012 Stewardship Award. Hiatt congratulated Barnes on recent environmental initiatives by the monastic community to protect streams running through the property as well protection of the property through a pending open space easement.